We’ve got a humpday treat for ya to cool off from that summer heat! Enjoy intimate shows that are basically like partying in your living room? Good. 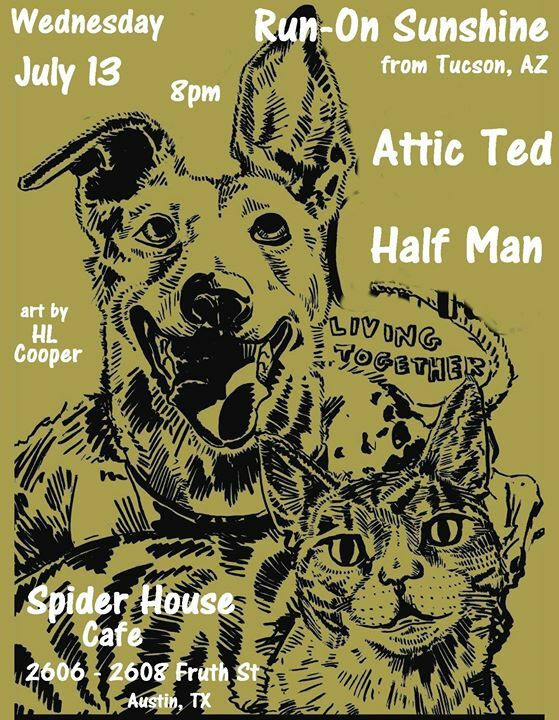 Check out cuddle punk, dessert dweller Run-On Sunshine (Tucson) inside the Spider House Cafe July 13th. Coffee, beers, JuiceLand specialty drinks, tequillas (all of them) and snax! Free and all ages, we’re gettin’ comfy so we can get weird. Get there early for weirdo parade Attic Ted and rawkers Half-Man. Party? Party. Doors at 8:00 pm. Did we mention it’s FREE and ALL AGES! Set times will be posted later, stay tuned!